Stopped by Baby Blues for their opening Saturday night. The rack of ribs was outstanding (easily feeds two). Cornbread, fixin’s, good sauce, collard greens, chicken, catfish, the whole deal, hell yeah. And everyone who works there is cool. Plus they have wicked business cards. On Mission and Precita, right across from Kragen and El Rio. Yo Johnny! My family loves BBQ…is someplace I can drag my old man too or is it strictly for young folks? 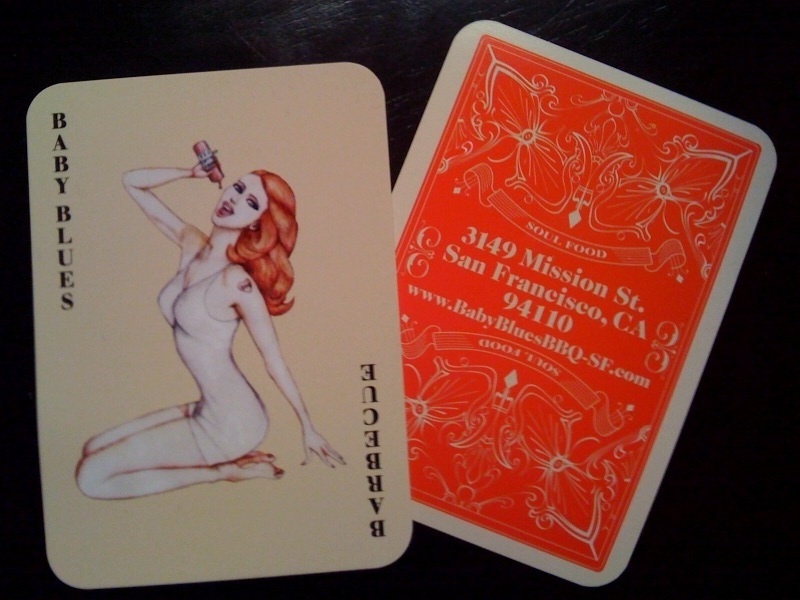 Usually we hit Nates but this sounds good and the playing cards are way cool. Call ahead though — they are installing a 2nd smoker and have to jump through some health inspection hoops and might be closed a couple of nights (like tonight). Hey, this is a chain from Venice. It’s their second shop, there’s some sort of family connection (I want to say the owner’s brother works down there, not positive). Definitely guys from the Venice shop up helping get them set up. Yeah, the same happened to me the week before christmas. As far as I can tell they are still in soft-opening phase, rough around the edges. I think the SFgate and Eater references overwhelmed them somewhat.